If you’ve ever sought out a golf GPS, you know that a simple Google search yields hundreds of results. Every golfer knows that knowledge is power on the golf course. When you have a clear picture of the distance between your ball and your target, you can make informed decisions. It’s no wonder our industry rushes to improve GPS technology every day. From watches to belt clips to smartphone apps to handheld devices, your favorite brands are finding new ways to meet demand. In cases like these, where the product selection is so vast, we keep our eyes on the leaders. Who was ahead of the curve when this new technology was first made available to golfers? And what new innovations have they moved on to as other companies scramble to keep up? One major leader in golf GPS technology is GolfLogix. This company was the first to introduce the handheld Golf GPS to the market, and they have remained at the leading edge ever since. The GolfLogix app is a prime example of rising to the challenges of a modern industry. The app serves as a GPS for over 35,000 courses and includes several other features designed to help you play better, learn more, and enjoy your time on the course. But it’s their newest Putt Breaks feature that solidifies GolfLogix’ place at the forefront of Golf GPS technology. We’re going to share everything we know about Putt Breaks. But first, we need to get you up to speed on the entire GolfLogix app, starting with the company’s best-known asset: precise and accurate course mapping. If you want tips to improve your putting, or tips to help with putting consistency, we can help there as well. In fact, it may just be your setup. But for now, we’ll get back to the Putt Breaks feature. Let’s clear up any questions of credibility right off the bat. GolfLogix boasts the most extensive and most up-to-date golf course database worldwide. Odds are, every course you play or have dreamt of playing is mapped out with total accuracy in the GolfLogix app. Next question: What exactly does an “interactive course map” entail? When you first log into your GolfLogix app, you land on a screen listing golf courses in your immediate vicinity. There is also a search box if you are looking for a particular course that is not nearby. Every single course features a map for each hole. The map shows you distances to the front, middle, and back of the green. You can also see your distance to the pin. Premium members are able to adjust their target to see distances for hazards and layups. This membership also includes Patented Club Tracking, which tracks the location and distance of every shot. When you’re standing at the tee, you’re often looking at the big picture. What’s the best target for this shot? How far away is it? Are there any hazards to work around? Are you shooting into the wind? GolfLogix boasts the most extensive and most up-to-date golf course database worldwide. Odds are, every course you play or have dreamt of playing is mapped out with total accuracy in the GolfLogix app. As you approach the green, it’s the tiny details that can make or break your shot. The smallest slope or change in surface can throw you off course. This is why GolfLogix has introduced their Putt Breaks Maps. The Putt Breaks feature includes two view options, depending on where you are in your game. Approach View is, of course, best for when you’re about to take an approach shot. 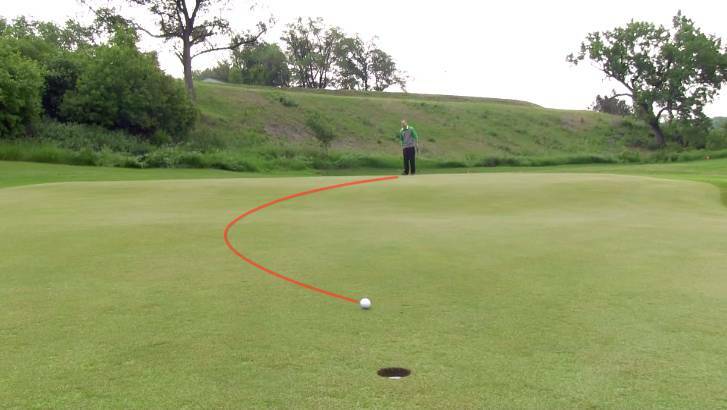 This feature shows you how the ball will roll when it lands on the green. Putt View gives you a bird’s eye view of how the ball will roll when you’re putting. …and a potential 3 putt that keeps rolling by. The Putt Breaks Maps are measured out exactly, with arrows showing you even the slightest change in slope. You know how easy it can be to miss that subtle side slope on a downhill putt? 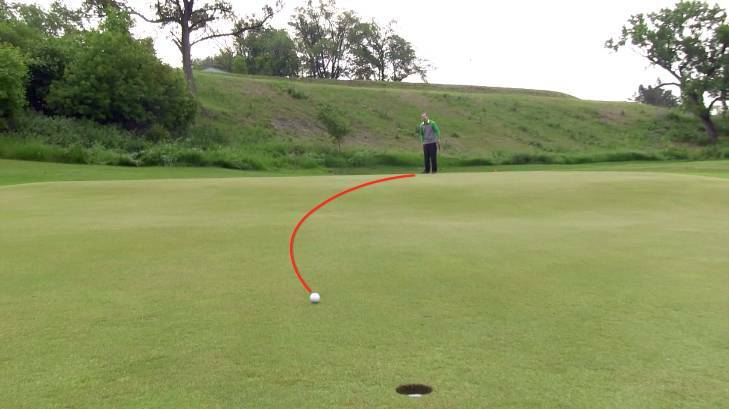 The Putt View makes sure you know it’s there. Putt Breaks is probably the most advanced and exciting feature on the GolfLogix app. But we still haven’t covered everything this app has to offer. In addition to the Golf GPS features, the GolfLogix app includes a few other bells and whistles to make your game as enjoyable as possible. The app connects you to GolfLogix’s online clubhouse community. Your app keeps score on every game you play – real and virtual. It tracks your stats, and it gives you the option to upload those stats to the online clubhouse. This way, you can share your data with other golfers and compete with your peers. You also have the option to share each round you play with anyone via email, text message, or social media. For added convenience, you can schedule tee times at many golf courses through the GolfLogix app. There may even be discounts available depending on your level of GolfLogix membership and the individual golf course. There is also a section of “Golf Digest Tips,” including small nuggets of wisdom as well as longer articles. Additionally, the app features free video lessons from great instructors, including Hank Haney, Mike Bender, and Todd Kolb. For more personalized instruction, members can also subscribe to My Golf Digest, available exclusively through the GolfLogix app. My Golf Digest offers “personalized analysis of driving distance, accuracy, and greens in regulation.” It also comes with unlimited video lessons from pros like Ryo Ishikawa and leading instructors like David Leadbetter. GolfLogix members are invited to try My Golf Digest for free. Subscription is priced at $0.99 per month or $9.99 for one year. As long as we’re talking money, let’s cover the different membership levels available through the GolfLogix app. The GolfLogix app does offer a free membership option. However, many of the features that set this app apart as a unique offering are available through paid memberships. There are three options for paid memberships. Premium Membership comes with Target GPS Distances. This is the feature that allows you to select custom targets so you can see distances for hazards and layups. Premium Membership also includes Patented Club Tracking, enabling you to track the location and distance of every shot you take. This membership level costs $4.99 per month or $29.99 for 12 months. Putt Breaks is the latest membership option, focusing more on giving you detailed information to help you crush your short game. This membership does not include Target GPS Distances or Patented Club Tracking. Instead, Putt Breaks gives you access to those incredibly precise Putt Break Maps. As you will recall, this includes the Approach View and the Putt View, both of which show you the slope of the green and give you an idea of how your ball will roll. Putt Breaks is priced the same as a Premium Membership. Plus Membership includes all the features of both the Premium Membership and Putt Breaks. It is also the only subscription option that comes with a one-week free trial. The cost of a Plus Membership is $9.99 per month, $39.99 for 6 months, or $49.99 for 12 months. It is also worth noting that paid memberships come with better Tee Time discounts than the free membership does. You’ve no doubt seen a Golf GPS before, but it’s safe to say the GolfLogix app is special. Let’s review the highlights that set it apart. GolfLogix has the most extensive and accurate database of golf courses in the world. Through the app, you can access maps for 35,000 courses. The app doesn’t only display distances to the green and to custom targets, it’s also tracks the way you play. GolfLogix keeps score and stores your stats so you can track your own progress and share it with the GolfLogix online clubhouse community. It also allows you to practice off-course with the Virtual Game feature. Most significantly, GolfLogix features Putt Breaks – a mapping system that enables you to see how your ball will roll on the green. Putt Breaks includes both an Approach View and a Putt View. This feature is a precise and accurate tool for planning those crucial short game shots and avoiding the cruel shock of a subtly sloping green. Is the GolfLogix app for you? Have you tried Putt Breaks? What did you think? Join us in the comment section to share your questions, opinions, and experiences. We welcome the opportunity to answer your inquiries or hear how you’ve used golf technology to enjoy the game more. And subscribe to our YouTube channel for great tips on a regular basis! Next post: What is a Golf Hook?